Salmon isn’t just for summer dining and grill parties – it is for your oven, for your radiant health, and you can eat it any day of the week in any season. While salmon may often be served with keto-friendly garlic green beans, it pairs nicely with an avocado salsa, especially since we are focusing on upping our fat intake here. The spices on the baked salmon are really what make this dish excitingly flavorful, 1 tsp. of ground cumin here and another teaspoon of onion powder there, all mixed together in a small bowl and generously sprinkled atop the salmon before baking. If you aren’t a salmon lover yet, you will be after you devour this dinner, but you will want to choose the right kind of salmon for the best experience. It ultimately depends on your budget and what is available at the market, however, if you can find wild-caught Alaskan salmon, then make that your first choice. It is one of those food items to eat less often, focusing on better quality when you can. Of course, it is perfectly suitable to consume salmon coming from the Pacific Ocean as well, just try to stay clear of farmed fish, because it won’t be nearly as nutrient dense and the flavor experience will be lacking. Since this dish is already bursting with savory bites, we suggest adding a very simple low-carb side dish of roasted or braised asparagus, just remember to use plenty of ghee or avocado oil in the cooking process. In a bowl combine the cumin, paprika, onion powder and chili powder; season to taste with salt and pepper. Brush the salmon fillets with the olive oil and lemon juice. Sprinkle the salmon fillets with the spice mixture and place in a baking dish. In a small bowl combine all the ingredients for the avocado salsa. Season the salsa with salt and pepper to taste, and gently toss until well mixed. 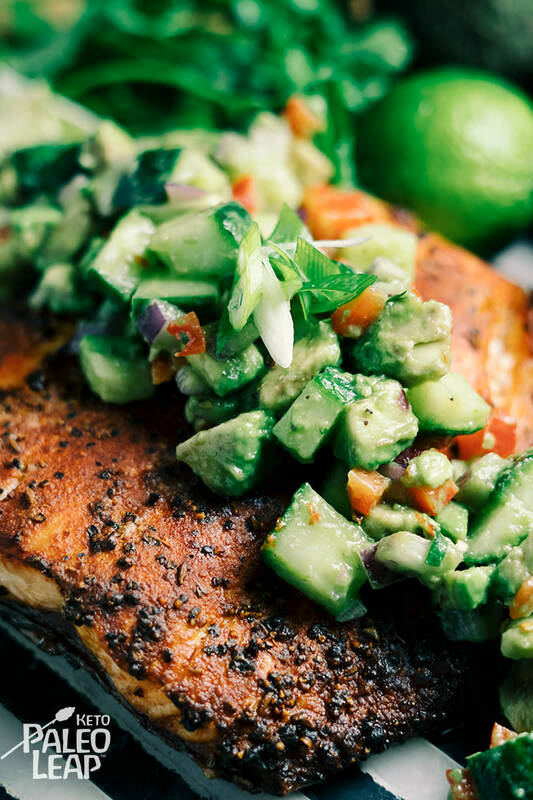 Serve the fish topped with the avocado salsa and fresh cilantro.